Can anyone have a wet room? Yes is the answer. Wet rooms are basically shower rooms which don’t have a tray and usually have an open, fully tiled shower area. If your shower room is large enough you don’t need to have a screen but if it is on the smaller side you will probably need a screen to stop everything in the room getting sprayed. Wet room installation is for the professionals as the room needs to be ”tanked” so that is waterproof and a gradient needs to be created on the floor to channel the shower water into a drain. It is then tiled to further improve the damp protection. We have years of experience of wet room installation. Call today for more information 07946353419. Wet room not for you? Maybe a more traditional or modern bathroom is more your style? If you’re going to have a luxurious, gorgeous shower you’re going to need a niche (or two). Niches or jail boxes as we’ve heard them referred to are all the rage in modern bathrooms. The benefit is that you have shelf space in a shower and it saves you from storing messy bath products around the bathroom. Niches can be made to feel like a small piece of art in an otherwise empty space. And when featured with special affect mood lighting they look even more attractive. Niches can be created in most walls and we have installed many. If you would like more information ask the installer upon survey. 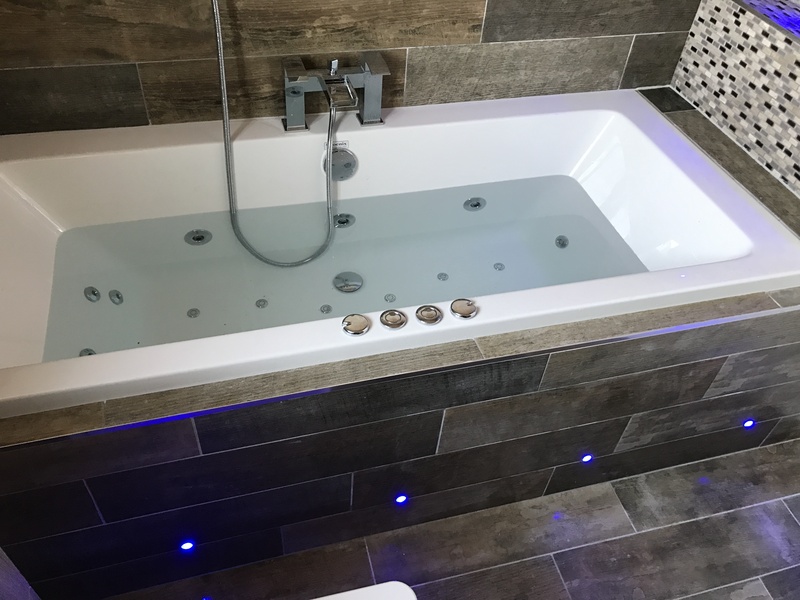 Another feature that is very popular is mood lighting and LEDs, we can create that tranquil bathroom space with special effect lighting to complete the look. For many people the bathroom is a place to unwind, reflect and energise. Taking inspiration from health spas we can suggest a range of quality products to create your perfect bathroom lighting. Ask for more information when arranging your quotation. We recently created a brand new ensuite from scratch, by building stud walls and separating a bedroom space and creating a new ensuite. If you have a large bedroom, alcoves or even an under stair cupboard we can create a new ensuite or downstairs w/c cloakroom. For more information on the options call 07946353419 or look here for more information on our services About us. If it is a traditional / vintage look you’re after then look no further. Here is a beautiful example of a recent traditional bathroom makeover we have completed. We complete all aspects of bathroom installation from start to finish, take a look here at the service we provide About us or call not for a no obligation quote 07946353419. Estimating the cost of a new bathroom – what costs are included? Whilst you can get a good evaluation of estimated costs when planning work on your new bathroom, the final figure can vary, based on complexity and the time taken to complete the job. The reason why costs vary is that each job will need to be priced in relation to individual circumstances. The size and shape of your bathroom will affect how easy a job is to complete, how long it will take and how much materials will be used. If there are complications like damp flooring or damaged piping then this will add to the quote. In general the average cost of a new bathroom includes furniture and installation. Wastage – your old bathroom will have to come out first and this will have to be taken away. Traders pay business rates to dispose of waste materials and it is costly. (You can keep costs down by arranging to take some of the materials to the tip yourself or by hiring a skip). No two bathrooms are the same so for a discussion about your project or for a quotation call 07946353419.